But these are just two scenarios, with many, many, many assumptions. And the assumptions make the projections. The fact of the matter is that scenario production is just an advanced game of guessing. But it’s also a form of actively trying to shape the future. While Oceans and Mountains differ, they stay within a certain universe of options that others have gone beyond. Furthermore, the Mountains scenario is largely about those in power retaining power to a greater degree, yet it somehow comes up with a better or at least equal CO2 emissions reduction curve. 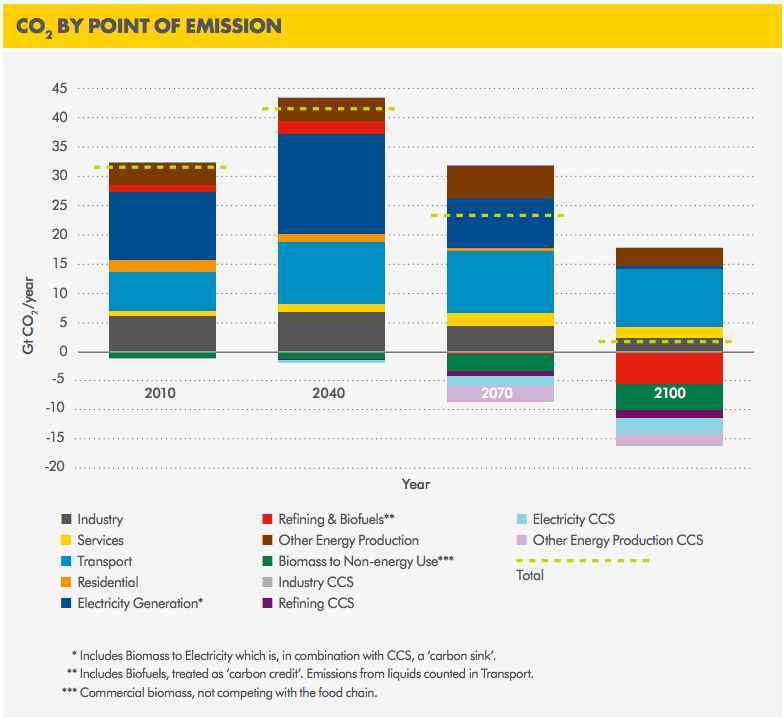 In other words, Shell promotes the idea through this comparison (which is based on innumerable and diverse assumptions) that it would be better (climate-wise) for those with more power (e.g. Shell) to retain that power. Of course, it doesn’t put it so directly, but the implication is clear. But, again, Oceans and Mountains both stay within a certain universe of scenarios. They could both be wildly off. As I noted on ZacharyShahan.com recently, a report by Ren21 has done an excellent job of comparing renewable energy projections or scenarios from a wide range of organizations, companies, and government agencies. That comparison shows very clearly that oil company projections/scenarios have generally been much less bullish on renewables than projections/scenarios from organizations like WWF and Greenpeace, and also less than those from “neutral” (but still very conservative) bodies such as the International Energy Agency (IEA). 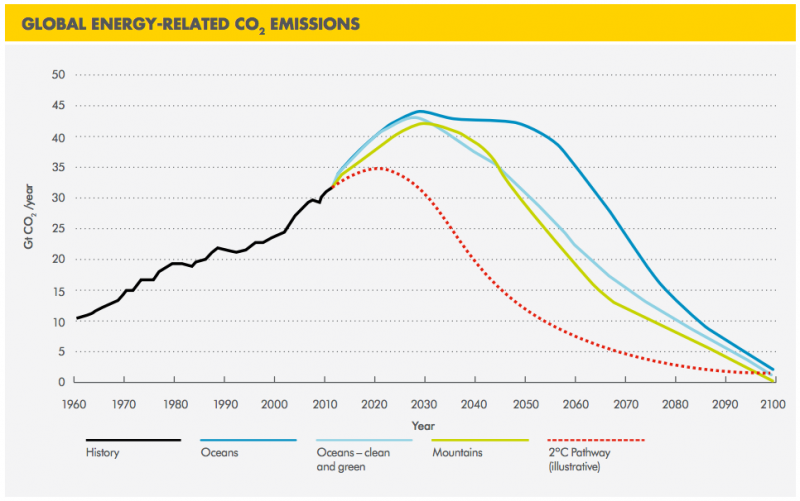 From Shell: “In the New Lens Scenarios, renewables reach a 30–40% share of total energy by 2060 in Mountains and Oceans, reaching perhaps 60–70% saturation if the time horizon is extended still further. Some may be disappointed with this figure, but there are good reasons why we will do well to reach even this level.” The company then goes on to do some hand waving regarding renewable energy potential (it’s not exactly the optimist on that front). As you can see above, Shell’s highest renewable energy projections seem to be well above ExxonMobil’s and BP’s, but they’re still well below WWF’s and Greenpeace’s. The attractiveness of decentralized solar power that lets common citizens share in the wealth of the tremendously large energy industry, or at least stop giving their own wealth to it, is a powerful force that many of us solar enthusiasts presume may stimulate exponential growth in solar for years to come. If that happened, solar could even go way beyond the projections in Shell’s Oceans scenario, especially if combined with a similar growth in electric vehicles. 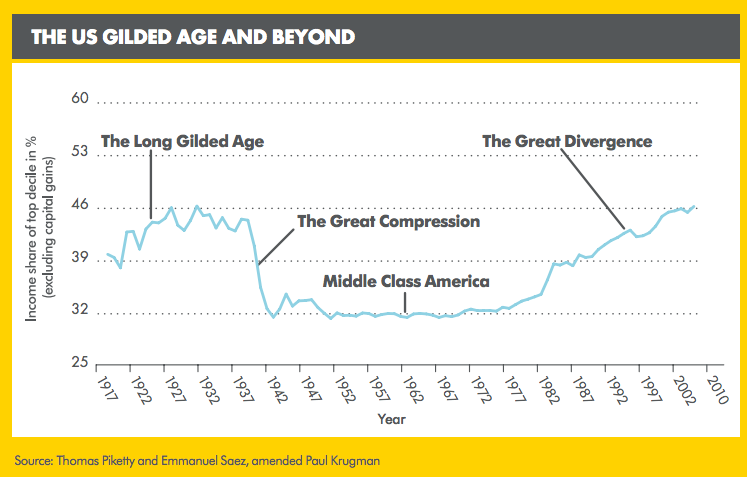 However, that is a great threat to many of the super rich, which the graph above shows have taken over the economy since the beginning of Reagan’s term as president. As such, there is great pushback from these rich and powerful people, rigging of the energy policy landscape wherever they can accomplish it, and enough misinformation put out there and repeated constantly to confuse the public and keep many people asleep to the potential of a democratized energy system. The question really is how much those at the top of the economic ladder will or will not keep the masses from bringing about a solar revolution in the coming decades (which would also likely be combined with an EV and energy efficiency revolution). Of course, there are many other societal factors to consider. But I think this post covered enough for now. Like it? Share it with your friends and family!